It’s a new kind of cookoff! Cooking teams will compete for prizes (and bragging rights) to the best dish, which must be cooked in cast iron cookware. It’ll be a fun day filled with live music, games, and delicious food. General admission is $5 to enter and includes a taste of all the dishes prepared. 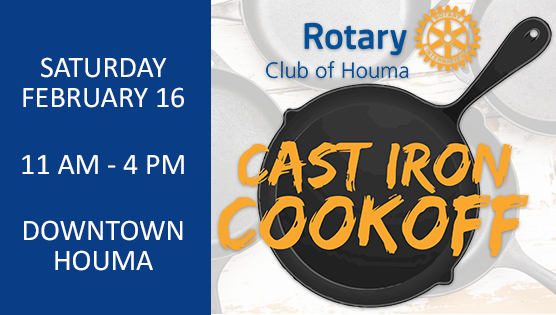 Proceeds benefit the many service projects of the Rotary Club of Houma. Get all the details at www.facebook.com/houmacastiron.